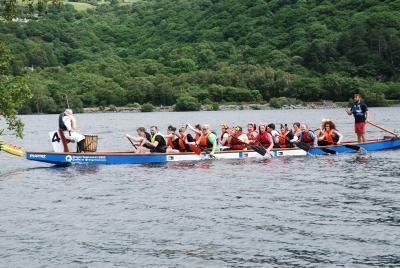 The School of Healthcare Sciences had a fantastic day as they descended onto the once peaceful but always beautiful Lake Padarn in Llanberis for the St. David’s Hospice Dragon boat challenge. A total of 22 teams entered the challenge which included two from Healthcare Sciences: one staff team and one student team. The boats raced in pairs and staff lined up against students, the banter had been built up over several weeks as intimidating pictures and videos of team members in training were exchanged on twitter so the stakes were high. 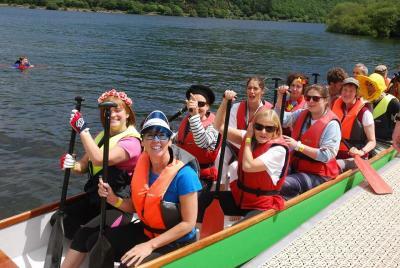 Both teams rowed hard and, although the staff team came out on top, less than ½ a second separated them from the students.